The climate of Alaska is determined by average temperatures and precipitation received statewide over many years. The extratropical storm track runs along the Aleutian Island chain, across the Alaska Peninsula, and along the coastal area of the Gulf of Alaska which exposes these parts of the state to a large majority of the storms crossing the North Pacific. The climate in Juneau and the southeast panhandle is a mid-latitude oceanic climate (similar to Scotland, or Haida Gwaii), ( Köppen Cfb) in the southern sections and a subarctic oceanic climate (Köppen Cfc) in the northern parts. 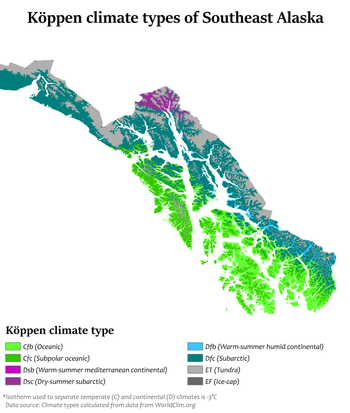 The climate in Southcentral Alaska is a subarctic climate (Köppen Dfc) due to its short, cool summers. 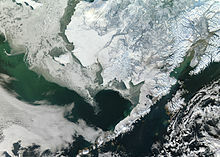 The climate of the interior of Alaska is best described as extreme and is the best example of a true subarctic climate, as the highest and lowest recorded temperatures in Alaska have both occurred in the interior. The climate in the extreme north of Alaska is an Arctic climate (Köppen ET) with long, cold winters, and cool summers where snow is possible year-round. The climate in the extreme north of Alaska is what would be expected for an area north of the Arctic Circle. It is an Arctic climate (Köppen ET) with long, very cold winters and short, cool summers. The sun does not rise at all during some weeks in the winter, and is out for 24 hours during some weeks in the summer. However, despite 24 hours of sunshine in the summertime, the average low temperature is barely above freezing in Utqiagvik in July, at 34 °F (1.1 °C) and snow may fall any month of the year. North Alaska is the coldest region in Alaska. Juneau averages over 50 inches (1,270 mm) of precipitation a year, while some other areas in southeast Alaska receive as much as 275 inches (6,980 mm). Average monthly precipitation generally peaks in September or October, and is lowest in May and June. Owing to the rain shadow of the coastal mountains, south-central Alaska does not get nearly as much rain as the southeast of Alaska, though it does get more snow with up to 300 inches (7.62 m) at Valdez and much more in the mountains. On average, Anchorage receives 16 inches (410 mm) of precipitation a year, with around 75 inches (1.91 m) of snow. 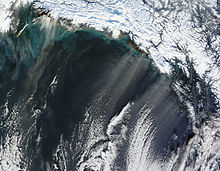 The northern coast of the Gulf of Alaska receives up to 150 inches (3,810.0 mm) of precipitation annually. Across western sections of the state, the northern side of the Seward Peninsula is a desert with less than 10 inches (250 mm) of precipitation annually, while some locations between Dillingham and Bethel average around 100 inches (2,540 mm) of precipitation. Inland, often less than 10 inches (254 mm) falls a year and on the North Slope as little as 4 inches (100 mm) of rainfall equivalent and 30 inches (0.76 m) of snow is typical, but what snow falls during the winter tends to stay throughout the season. Thunderstorms are fairly rare in most of Alaska, but do occur in the interior in the summer with some frequency and may cause wildfires. Anchorage gets a thunderstorm every few years. There has even been the rare thunderstorm in Utqiagvik on the Arctic coast. While weak tornadoes and waterspouts, while extremely rare, do sometimes occur, Alaska is considered the least tornado-prone state in the United States. ^ Null, Jan. "Wind Names". Golden Gate Weather Services. Retrieved 17 April 2017. ^ a b Mean Annual Precipitation in Alaska-Yukon Archived 2007-06-19 at the Wayback Machine. Oregon Climate Service at Oregon State University. Retrieved on 2006-10-23. 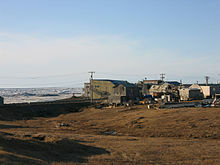 ^ History for Barrow, Alaska. Monthly Summary for July 2006. Weather Underground. Last accessed 23 October 2006. ^ a b "NOAA Weather Radio All Hazards Information - Alaska Weather Interesting Facts and Records" (PDF). National Oceanic and Atmospheric Administration. Retrieved 2007-01-03. ^ a b "State Extremes". Western Regional Climate Center, Desert Research Institute. Retrieved 2007-01-03. ^ "SD Weather History and Trivia for May: May 1". National Oceanic and Atmospheric Administration. Retrieved 2007-01-03. 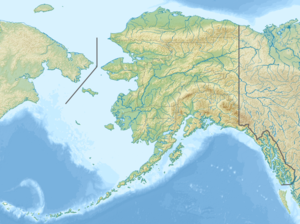 ^ "FAQ ALASKA - Frequently Asked Questions About Alaska: Weather". Statewide Library Electronic Doorway, University of Alaska Fairbanks. 2005-01-17. Archived from the original on 2007-01-02. Retrieved 2007-01-03. ^ Ned Rozell (2003-01-23). "The Coldest Place in North America". Geophysical Institute of the University of Alaska Fairbanks. Retrieved 2007-01-03. ^ Western Regional Climate Center. Climate of Alaska. Retrieved on 2008-03-19. ^ John Papineau, Ph.D. Understanding Alaska's Climate Variation. Retrieved on 2008-03-19.